Greeno® is the only one that brought Golden Clam® to the world. 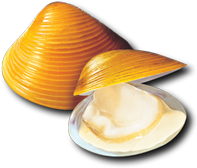 Golden Clam®, is the unique and all-natural best food for the liver. What Is GREENO® Golden Clam®? Clam is extolled as the "best food for the liver"
It has been nature's most wonderful gift to everyone's health for hundreds of years as noted by ancient textbooks of wisdom. Produced in the world's only organic algae and natural freshwater farm, GREENO® Golden Clam®'s rich combination of nutrients help to revitalise the liver, elevate energy level and stamina. What you eat, where you live, and what you do all can affect your liver performance. A lot of stress from work, long working hours, lack of rest and sleep, consumption of alcohol and tobacco, poor diet and eating habit, often leading to physical exhaustion and resulting in poor general health. If your liver can not function well, you may exhibit a number of symptoms include constipation; loss of appetite; nausea after fatty meals; oily taste in the mouth; frequent headache not related to stress, skin problem, loss of libido, no stamina, etc. The liver is the largest gland and solid organ in the body, weighing 1.2 kg to 1.5kg. It is a complex chemical factory that works 24 hours a day,louis vuitton outlet and has over 500 estimated functions. It is the most important organ in detoxification. It is unique in its ability to regenerate and can survive 80% damage without painful feelings. Liver disease is sometimes referred as a silent killer. Most people are often not aware they have the liver disease until it is too late. Copyright 2011 BIO GREENO® Sdn Bhd. All Rights Reserved.